While you may think people are born with this quality...or not...the truth is there's a lot you can do to create a more powerful presence. Try these strategies to increase your ability to inspire and influence others with the sheer force of your personality. Watch your posture. Whether you carry yourself like a dancer or a warrior, stand up straight and command the room. Use hand gestures to appear relaxed and natural, but make sure you keep fidgeting under control. Make gentle eye contact but don't lock stares. It makes people uncomfortable. Some people say you should mirror the other person's grip when you shake hands, but I prefer a firm (but not killer) grip and a warm smile. Vocal Power. Arrgh, this one drives me - and others - crazy. Tape yourself and listen to your speech so you can add clarity, power, and gravitas to your words. Practice using a deeper tone (i.e. vocal register) to increase credibility. Ladies, this can be a little tricky for you, but it's well worth the effort. Research has shown that people with deep voices, like people who are tall, tend to do better professionally than others. Don't bore people with your voice. Vary the pitch, rate, and rhythm of your speech to add color and punch. Veritas. Latin for truth, veracity should be at the heart of your leadership presence. Voice and non-verbal behaviors are important in developing presence, but nothing is more important than having integrity and exuding authenticity. When you have the courage to express your point of view with passion - even if it could be unpopular - people will not only want to listen, they'll want to follow! 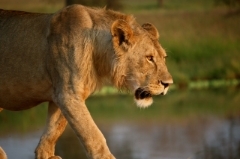 Lion photo courtesy Simon Belcher of the amazing Royal African Safaris! Newer PostAre You Leaving a LEADERSHIP Legacy?